MONTREAL, Jan. 31, 2019 /CNW Telbec/ - Air Canada today was named one of "Montreal's Top Employers" for the sixth consecutive year in Mediacorp Canada Inc's annual employer survey. The 2019 survey recognizes companies in Montreal with exceptional human resources programs and forward-thinking workplace policies, and includes a comparison of others in their industry and region. "Air Canada is a global company headquartered in Montreal with over 9,000 employees in the area, and we are very proud to be chosen as one of Montreal's top employers again. Our leadership in emerging areas such as using artificial intelligence and predictive thinking to continue transforming our business means being recognized as an employee-focused place to work with diverse and interesting career opportunities enables us to attract and retain the best and the brightest people in all areas of our business," said Arielle Meloul-Wechsler, Senior Vice-President, People, Culture and Communications. 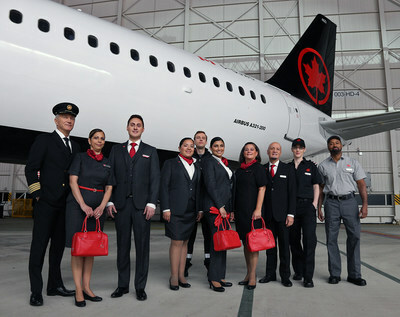 Air Canada's reputation as a top employer has made the airline a destination of choice for people seeking a challenging career. It receives 23,000 visits each month to the employment page of its website and on average there are 340 applicants per position for each vacancy filled. In 2018 alone, Air Canada has hired more than 5,700 people. For more information on career opportunities with Air Canada please visit www.aircanada.com/ca/en/aco/home/about/careers.html. one of Canada's Best Diversity Employers for 2018 by Mediacorp Canada Inc. Air Canada was recognized for having a defined strategy to achieve diversity and inclusion including partnering with organizations to match unique qualifications of candidates with disabilities to specific roles, and for successfully promoting women, including in non-traditional roles. Additional information on Air Canada's Human Resources is in the "Employees" section of the 2017 Corporate Sustainability Report at: https://www.aircanada.com/ca/en/aco/home/about/corporate-responsibility/corporate-sustainability-reports.html#/par2_accordion.